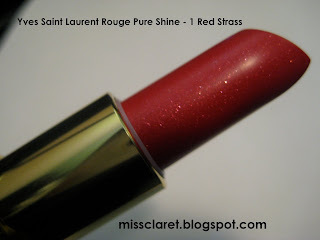 Another red lipstick I recently purchased was YSL's Rouge Pure Shine in 1 Red Strass. 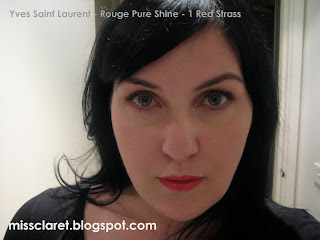 I don't wear sheer lip colour all that often so was I not entirely sure what to expect. The colour turned out to be a summery raspberry and lightly scented which was lovely, however I could feel the little bits of glitter which I guess were added to give that wet shine look. 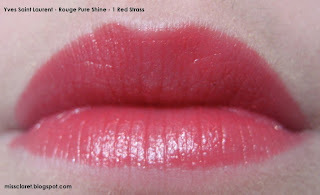 Being sheer, the staying power was not like that of a satin finish or matte lipstick and I did find that it moved. I would certainly recommend wearing a clear lip liner (like one from Revlon or Benefit) to ensure the colour stays in place. I found that on the lips, the colour appeared lighter. The packaging, however is exquisite, somewhat Art Deco with a modern twist. 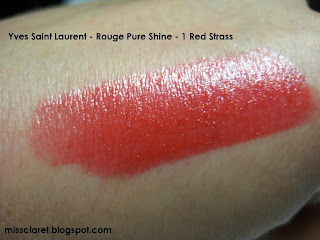 In recent months I have been very impressed with YSL's lipstick packaging - so did not regret this purchase at all.